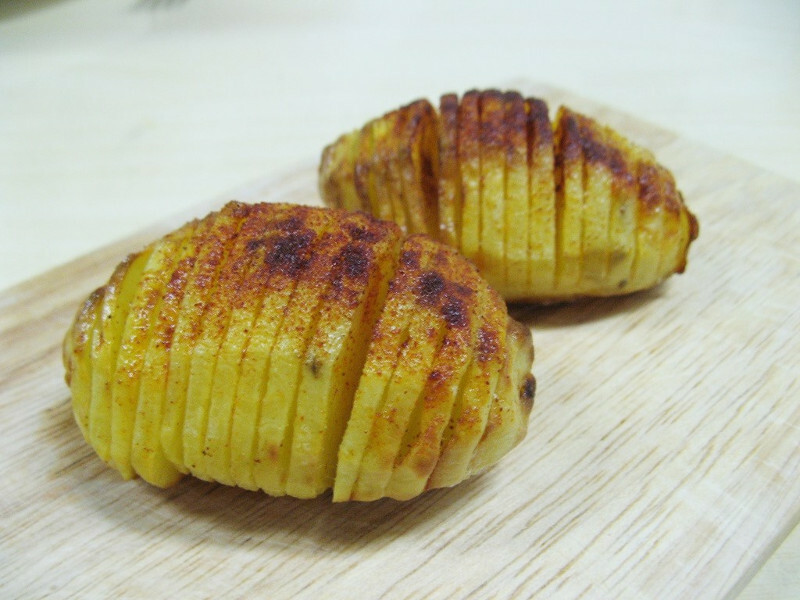 Hasselback potatoes are a stellar side dish when you want to wow special guests. Deep parallel cuts let the butter's rich flavor penetrate to the heart of the potatoes as they bake and ensure a golden-brown crust. Preheat oven to 350°F. Use a sharp knife to make parallel cuts in each potato that go about two-thirds of the way through the potato. Take care not to cut all the way through the potatoes. Space the cuts about 1/8 inch apart along the whole length of the potato. Spread 3 tablespoons of the melted butter in the bottom of a baking dish large enough to hold the potatoes. Place the potatoes, cut side up, in the baking dish and drizzle with the remaining 3 tablespoons of butter. Season with salt and pepper and place in the oven. Bake for 30 to 40 minutes, basting with butter from the bottom of the dish every 15 minutes or so. Give the potatoes a final baste of butter and sprinkle the potatoes with the breadcrumbs. Return to the oven and continue baking until the potatoes are golden-brown and cooked through, another 20 minutes or so. Gratin Topping: Mix the breadcrumbs with 1/4 cup grated Parmesan cheese and sprinkle this mixture over the potatoes for the last 20 minutes of baking. Place the potatoes briefly under the broiler if necessary to finish browning the topping. Top with sour cream and a sprinkling of chopped fresh dill or chives if you like.